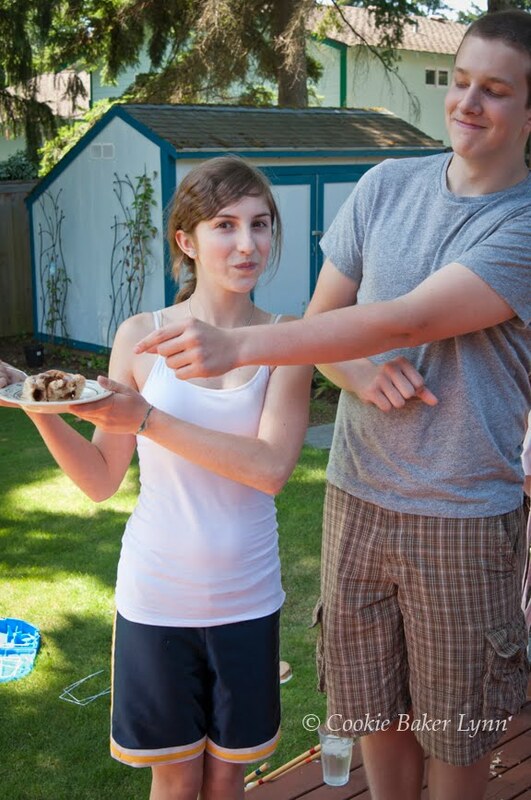 The original invitees to Cooking Camp were Serena, Tall Friend (TF) and Little Friend (LF). The plan was to meet every Friday through the summer and have them learn new kitchen skills and techniques. That plan was derailed when LF had to go out of town for 3 weeks. So the second Cooking Camp was smaller. Which actually was just as well because it involved lots of caffeine. We made coffee ice cream and iced coffee, and the three of them amped up on caffeine might have been more than my kitchen could handle. 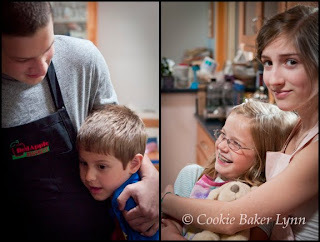 This week, to add a little zip to the mixture, we invited the younger siblings. TF's little sister, SF (Short Friend), and Serena's little brother, Samuel, (Samuel) made guest appearances. They were both thrilled to be invited to be part of the cool kid crowd. They were also thrilled that we were making cinnamon rolls. And not just any cinnamon rolls, but monster cinnamon rolls. Then while the rolls baked, they got in a game of Calvin Ball Croquet. So, another successful Cooking Camp in the bag! enough milk to make glue-like consistency, about 2 Tbsp. 2- In the mixing bowl of a stand mixer, sprinkle the yeast over the warm water, add the remaining tsp sugar, stir, and set aside for 10 minutes, until the mixture is bubbly. Add the lukewarm milk mixture and the eggs and beat until well combined. 3- Add the flour a cup at a time, stirring and using enough flour to form a stiff dough. Turn out on a floured board and knead until smooth and satiny, approximately 10 min. (or place in the bowl of an electric mixer and knead with a dough hook until the dough cleans the sides of the bowl, approximately 5 min. I have a 5 quart KitchenAid and the dough burbles up and wraps around the dough hook, so I need to scrape it down frequently). 4- Place the dough in a very large buttered bowl, turn to butter the top, and allow to rise, covered loosely with a kitchen towel, in a warm place until doubled in bulk, approximately 1 hour. 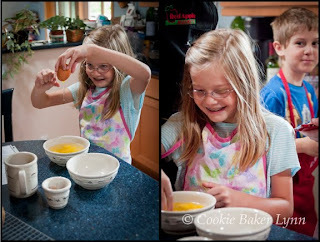 5- When the dough has doubled, punch it down and divide it in half. Roll one half out to a large rectangle, about 12" x 24". 6- Butter two 9 x 13 baking pans. For the filling, melt the butter. Spread 1/2 the butter evenly over the surface of the dough. Combine the sugar and cinnamon and sprinkle 1/2 of it evenly over the melted butter. 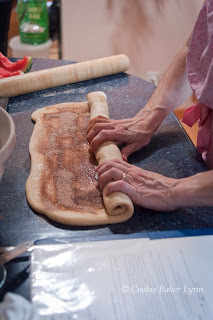 Roll up the dough lengthwise, pinching the dough together to form a seam when rolled. Cut the dough log in quarters, and then each quarter in thirds. If you are particular about pretty rolls, trim off the ends. 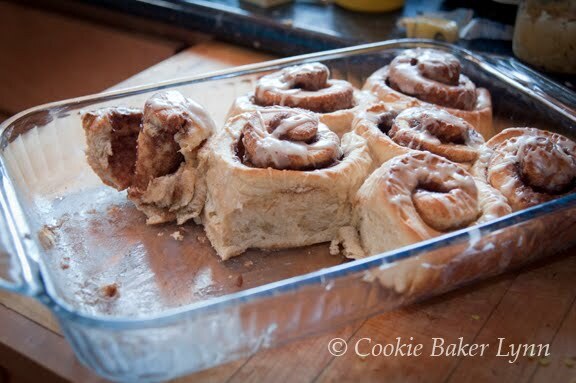 Place the rolls in a buttered 9 x 13" baking pan. Repeat with the other half of the dough. Cover the rolls loosely with a kitchen towel and allow to rise until doubled in bulk, about 1 hour. 7- Preheat oven to 350 degrees. Bake the rolls for about 20-30 minutes or until puffed and browned. Mix the icing ingredients and drizzle over the rolls. Allow to cool to room temperature on racks (if you can). Combine 1/2 lb. cream cheese, softened with 1/4 cup whipping cream and 1 tsp vanilla extract until smooth. 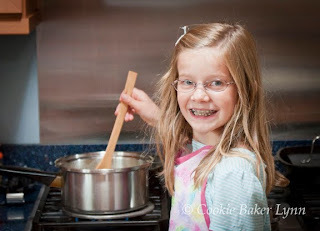 Add 3-4 cups confectioner's sugar, sifted, blending until smooth and soft, not stiff. If you want to "pimp up" your rolls, you can throw raisins, chopped nuts, coconut, or your favorite exotic ingredient into the filling. I love the last picture! (in the middle of the recipe) It just perfectly captures the cinnamon rolls.... Awesomeness. Oh, how nice! 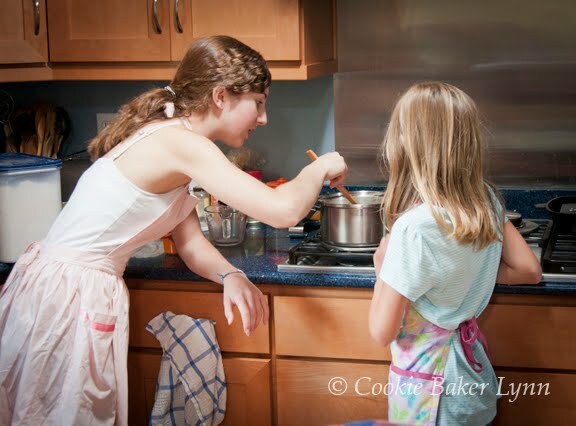 I didn't realize before that you were having the classes in your kitchen, what a good idea! And a very nice way to spend time together! Every time I read about it I want to come to Cooking Camp Lynn:D How's about parents being added as well as slblings..I just need to adopt a little once since my sweetie is 23 years old. Sounds like fab fun, including the Calvin Ball game. Wish I could join you! ... and that's a swell time had by all with monster cinnamon rolls for reward. my favorite add in for cinnamon rolls is dried blueberries ... would fresh work? to messy. Too awesome. Are you having as much fun as the kids? :). And I hope you have a final exam ready where they bake for teacher. Just make sure that it's a take home exam :).